Bed #3, the farthest one to the left, is now planted. I've installed the additional hardware and art on the chicken coop. Progress is slow. Oh boy, it’s raining today. We get so little rain here in coastal southern California, that it’s cause to celebrate. I have some containers set out to collect rain from the roof because I STILL don’t have my rain barrel hooked up to the gutter’s downspout. I’m an incredible procrastinator, and the older I get, the slower I go. Cauliflower will be ready to pick very soon. I harvested kale yesterday to go into a nice dish of sauteed kale with 1/3 C pecans, 1/4 C orange-flavored cranberries and a splash of raspberry vinegar. Earlier in the week, I picked 3 bok choy and 3 bell peppers to go into a turkey stir-fry. I planted this kale in the fall of 2007, and it's still growing. It flowered last summer. I collected seeds, cut the flower stalks, and it continues to produce nice kale leaves. I grow baby bok choy in 15" shallow terra cotta bowls. I harvest the first ones as tiny babies, leaving a few to get larger. If you harvested anything this week, visit Daphne’s Dandelions and post your harvest on Mr. Linky. In southern California, it’s also planting season for cool weather vegetables. This week I planted Kailaan and Komatsuna Japanese greens. Both are new plants for me, but the seed is old. Not sure if they’ll sprout or not. Last week, I planted parsley and German white icicle radishes. The week before that I planted raised bed #3 with onions, snow peas, lettuce, spinach and cauliflower. 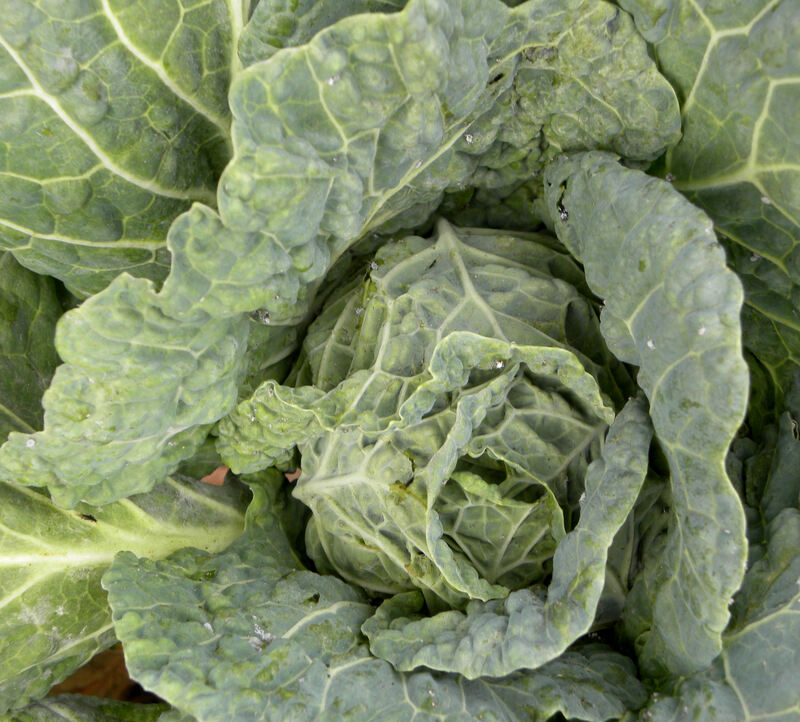 I planted the seeds for this savoy cabbage last January. The plants stayed tiny all summer and didn't start to really grow and head up until fall. They should be ready to harvest in a few more weeks. This entry was posted in Uncategorized and tagged bok choy. 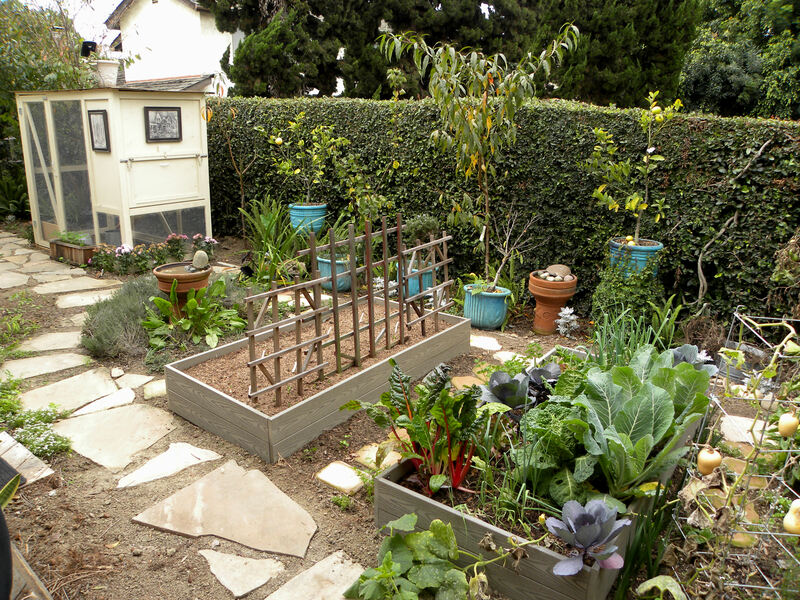 bell peppers, cauliflower, chicken coop, Kailaan, kale, Komatsuna, radish, rain, recipe, southern California, vegetables, water storage. Bookmark the permalink. Your garden looks great. Hard to believe that the cabbage has taken almost a year. We’ve had rain today also, it’s so nice for a change, but it’s really cold also (not so nice). The Mr. Linky thing didn’t work when I clicked on your name, I had to use the link on your comment. Hi Michele. I’ve never grown cabbage from seed before, but I’m pretty sure it shouldn’t take a year. My leeks are probably going to take about as long. I started them in January last year, and they still aren’t ready to harvest. Love your lovely view of the Santa (Susana? Lucia?) Mountains at From Seed to Table. The garden looks lovely! I harvested some Komatsuna for the first time last week, and it was tasty. I stir-fried it with some shiitake mushrooms and garlic. Hi Villager. We appear to be fellow Hoosiers. My ancestors settled in southern Indiana when it first opened up in the 1820s, but I left for Colorado, Connecticut and now California. I’ve run out of states that start with C, so I’m staying here. I do envy your 1.5 happy acres. And I’ll keep your Komatsuna, garlic and mushroom stirfry in mind if my komatsuna graces me with a harvest. I can’t believe your kale has lived for two years. I always thought they died once they bloomed. This is the first year I’m growing it so had no clue. I wonder if I can get mine to live over the winter. Hi Daphne. I didn’t know it would continue to grow after it bloomed either. I thought maybe it woud get bitter, but the leaves are just as tender and tasty as ever. I’m pretty sure kale is frost hardy and will hold up to a light frost. We had ice on the cars yesterday morning, and frost on the roof, but no plant damage. Wow, all your crops look great! Thanks Dan. Anything still growing up your way in Canada? Yesterday at our garden parties, one of the things we tried to show the public was that you can grow crops even in winter! 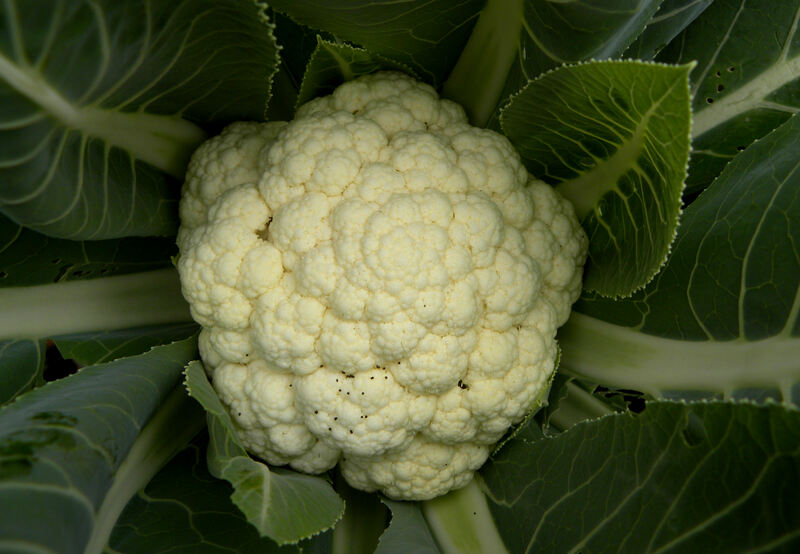 Oh, wow…that cauliflower looks fabulous! And absolute perfect I might ask. I can’t wait to try my hand at growing some next year. I can’t wait to read about how it tastes! Hi Thomas. I’m pretty pleased with the cauliflower. I tried it last year for the first time but it bolted. Other gardeners had trouble with theirs too. This looks like it will make it to harvest just fine. I sprayed with BT early on when the plants were young. Should have sprayed again this week. You probably know this, but BT is Bacillus thuringiensis, a bacteria that targets butterfly and moth larvae. It’s OK to use it in an organic garden as it is a biological pest control, not a chemical pest control. This is a great harvest! When I’m looking at your pictures, I’m missing my garden and cant wait for spring. I was jubilant when I finally went to check on my vegetable garden. I had steeled myself to look at poor dead vegetables, but they were all beautiful! They had quite a long time at 21F, but they are fine. I am so happy! I love the pics of your garden. Do you keep a running total of the produce from the garden? Hi Janie, I never thought to weigh or keep track of my produce until I saw what Daphne does at Daphne’s Dandelions. I was totally focused on EATING it. I plan to attempt a running total starting January 1. Another New Year’s resolution. That cauliflower is so pretty! I have kale from last year that bloomed this year, and some newly planted that I assume will bloom next year. I left the kale that had bloomed hoping the rabbits and caterpillars would eat it and leave the other alone. It’s good to know you can still eat kale after it has bloomed. I didn’t know if it would get bitter. Next year, I won’t plant more. Hi Sue, thanks for stopping by. Sure looks cold in your corner garden up in Nebraska. I’ve been tearing kale and mixing it with greens and the last of my leaf lettuce for salads. Never fear, Pamela, spring will come.